HOUSTON, Texas (KTRK) -- The attention of the nation now falls on Harris County as deputies seek justice for a 7-year-old girl who was gunned down Sunday while in the car with her mother and three sisters. 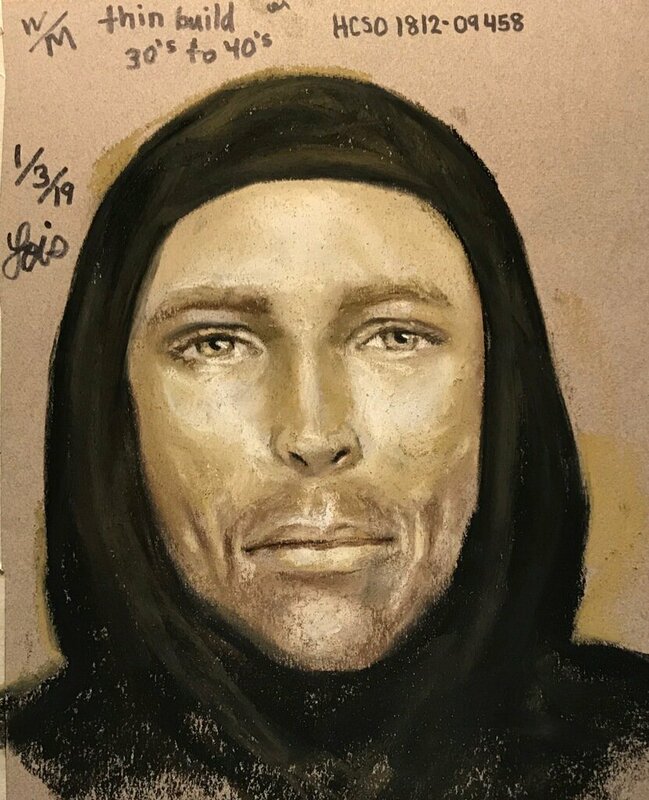 A suspect sketch and clearer video of his truck were released Thursday in the hunt for Jazmine Barnes' killer. During a meeting with media on Thursday, Jazmine's mother, LaPorsha Washington, provided a new description of the suspect. NEW, CLEARER VIDEO: Have you seen the shooter's truck? Sheriff Ed Gonzalez released new, clearer video Thursday showing the suspect's truck in Jazmine Barnes' murder. She said he was a white man with blue eyes, wearing a black hoodie and looked "sick" and skinny. Washington said the man did not have on glasses and did not have a beard, which was previously reported. Washington and Jazmine's two older sisters then met with renowned sketch artist Lois Gibson at the Harris County Sheriff's Office Detective's Bureau. "They were quiet but strong," said Gibson of the sisters, ages 13 and 15. Gibson says the sketch took about an hour to complete and she had to make only a few tweaks. When she showed them the sketch, Gibson said the girls were weeping. "They were really good. He will look like this. This will be a good image," she said. Also Thursday, Washington described more of the encounter with her daughter's killer. She said the red truck was on the passenger's side of her vehicle before the shooting. Washington said the driver of the pickup truck went behind her vehicle before switching lanes and getting on the driver's side. The suspect then reportedly started firing shots on the driver's side of the vehicle, where Washington was in the driver's seat and Jazmine was sitting directly behind her. Jazmine's 15-year-old sister, Alxis Dilbert, was able to see the suspect's face. "You know when you're driving and you look in someone's car and you make eye contact? It was like that," said Dilbert. The search for Jazmine's killer and the effort to bring him to justice has gained recognition nationwide with celebrities, including Gabrielle Union, Olivia Wilde, Ava DuVernay, Bun B and Trae Tha Truth calling on people to help solve her murder. Jazmine died after investigators say someone in a red, four-door pickup truck pulled alongside her family's vehicle near a Walmart along the east Beltway and Wallisville Road and fired. "Justice will prevail and I'm going to be leading the charge. I won't stop. I won't quit. I don't care how long it takes," said Chris Cevilla, Jazmine's father. Deputies are searching for the truck. The ATF is also conducting its own investigation, analyzing shell casings from the scene and then putting the information in a database to see if it matches any other shootings. Home video shared of Jazmine shows a happy, bouncing girl. Her family called her Jaz. Jazmine's mother says she's just trying to make it through this difficult time. "I'm just here. When I say 'I'm just here', I'm taking it one day at a time and I'm here. I got three other kids that need me to be strong for them and they're going through a lot," Washington told ABC13. A Justice for Jazmine rally is planned for this Saturday at noon in the parking lot of the Walmart on the East Beltway. On Tuesday, Jan. 8, a viewing is planned for Jazmine at 10 a.m., followed by a public funeral at noon. The service will be held at Green House International Church at 200 W. Greens Rd. Purple balloons will be released in honor of Jazmine and all murder victims in Houston and Harris County after the service.